Kathmandu: The chairmanship of the Bay of Bengal Initiative for Multi-Sectoral Technical and Economic Cooperation (BIMSTEC) was on Friday handed over to Sri Lankan president Maithripala Sirisena by Nepal’s prime minister Sharma Oli. The Chairmanship of the BIMSTEC rotates among the member states. Nepal is the present chair of BIMSTEC. Oli handed over the chairmanship of the seven-member grouping to Sirisena at the end of the 4th BIMSTEC Summit in Kathmandu. The 5th BIMSTEC Summit will be held in Sri Lanka. BIMSTEC is a regional organisation comprising seven member states lying in the littoral and adjacent areas of the Bay of Bengal constituting a contiguous regional unity. It constitutes five countries from South Asia — Bangladesh, Bhutan, India, Nepal, Sri Lanka, and two from Southeast Asia — Myanmar and Thailand. The objective of building such an alliance was to harness shared and accelerated growth through mutual cooperation in different areas of common interests by mitigating the onslaught of globalisation and by utilizing regional resources and geographical advantages. Prime minister Oli congratulated Sri Lanka for its assumption of the role as new host for BIMSTEC, and extended thanks to the heads of governments of member countries for their participation and support in materialising the summit with success. 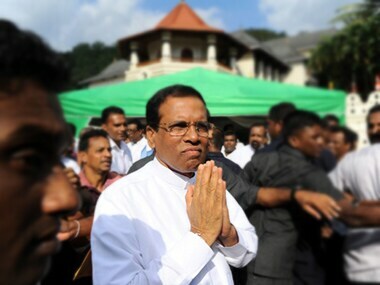 All the state leaders extended their best wishes to Sirisena for his new appointment as the chairman of the BIMSTEC and they expressed confidence that the functions of the BIMSTEC will move forward with strength under the leadership of him.